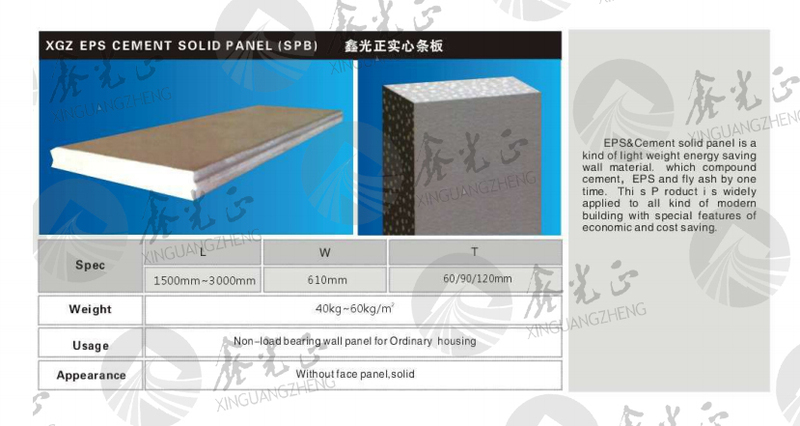 Heat Preservation: Major material for wall panel is anti-freezing, heat preserving and environmental friendly. Heat Insulation: Adjust the indoor temperature at a constant range. 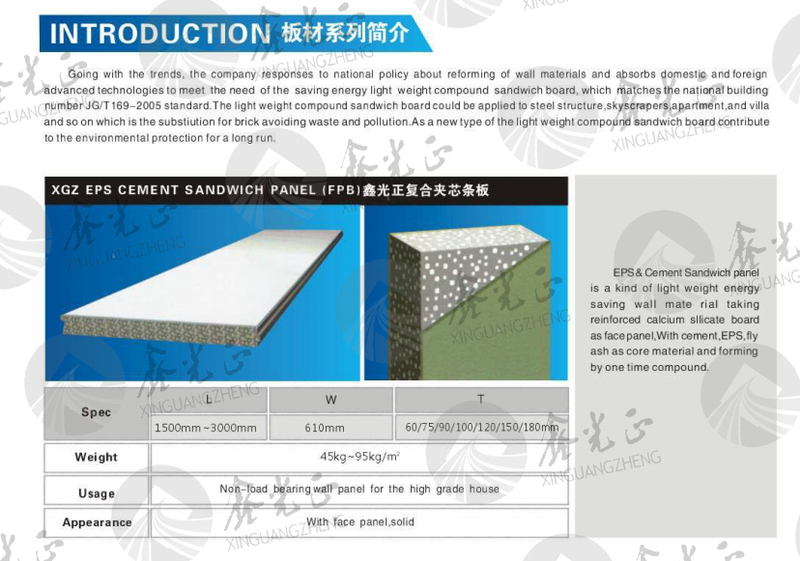 Fire Proof: Both face sides with 4.5mm calcium-silicon fire proof board, thus XGZ Eps and Cement sandwich panel can be against a high temperature of 1000°C for 4 hours. Water Proof: Tests has proved that water containers can be made by XGZ Eps and Cement sandwich panel without absorbing functions and no leakage at all. 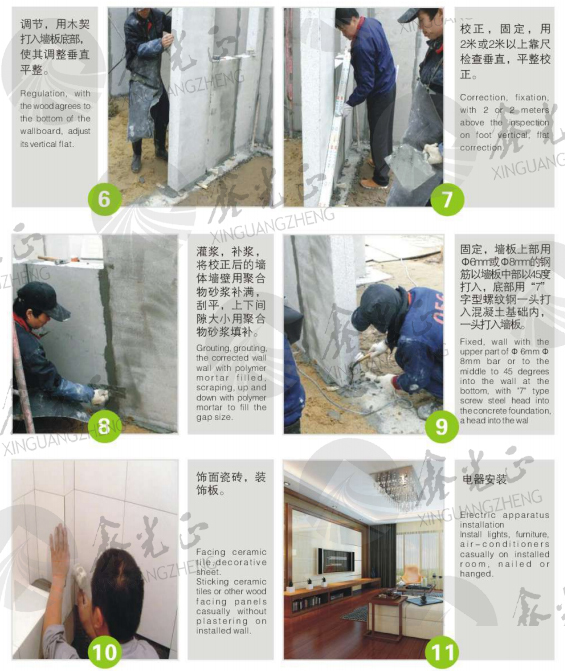 Sound Insulation: The inside of XGZ wall panel material (EPS polystyrene grain) has fine sound insulation and sound-absorbing functions. Shorter Time: For a 50sq. 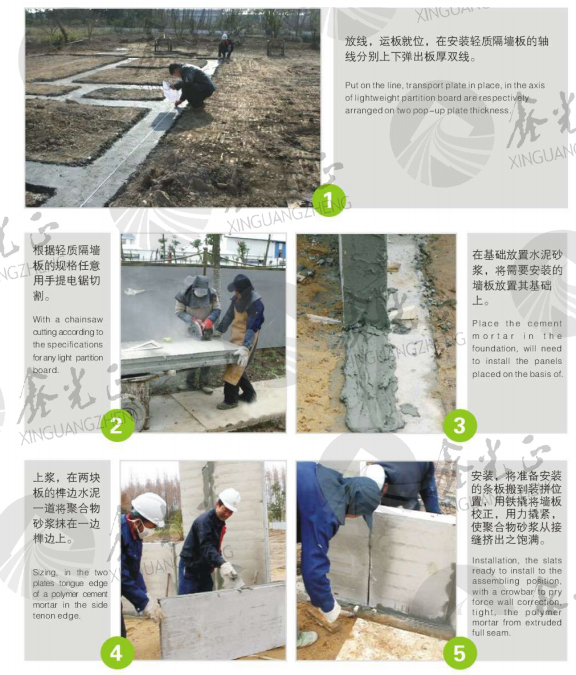 house, using XGZ Eps and Cement sandwich wall panel, three people can finish it within ONE day, while using traditional block, it will take at least SEVEN days with ONE WEEK to finish. 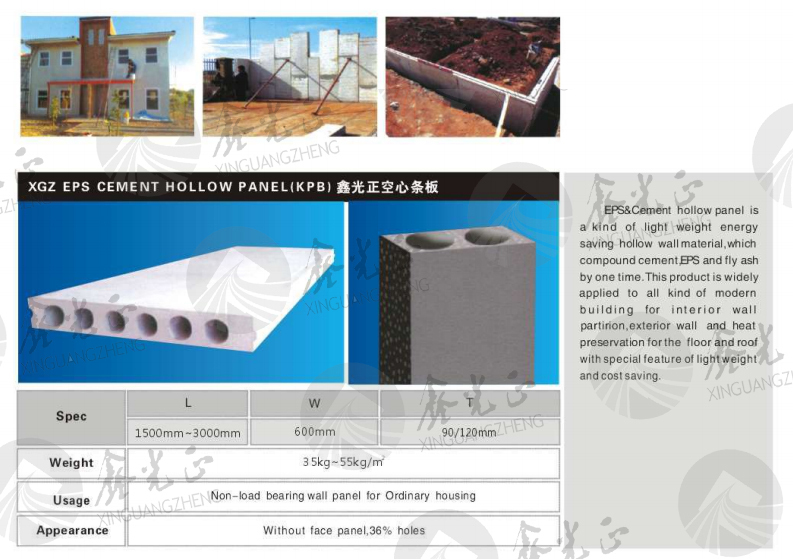 High Intension: XGZ Eps and Cement sandwich wall panel can be nailed directly or have expansion bolt to lift and hang heavies, it can be covered by ceramic tile, wall paper, wood panel, coating etc. 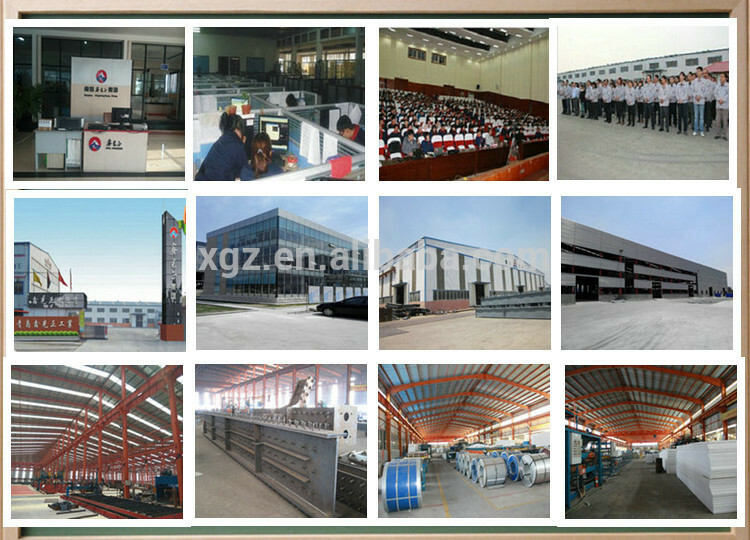 Earthquake Resistance: The Seismic performance of XGZ Eps and Cement sandwich wall panel is at a magnitude of 8.5. 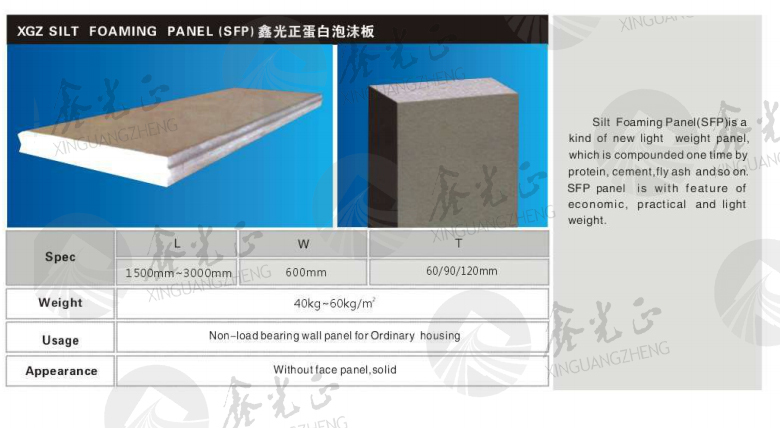 Space Saving: XGZ Eps and Cement sandwich wall panel with the thickness of 60mm-180mm, as a thin and solid new type construction material, it will save a lot of construction space compared with the traditional block. 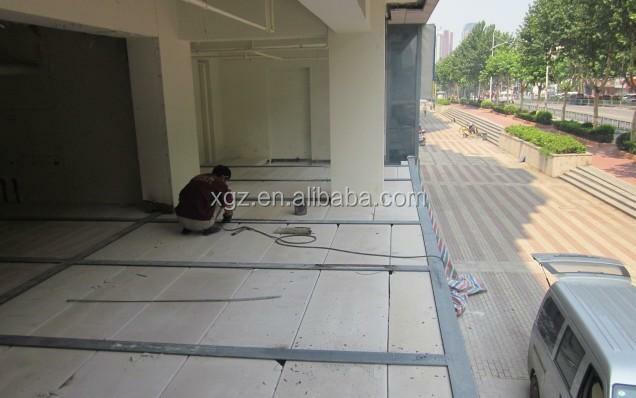 Labor Cost Saving: As XGZ wall panel is easy and fast to construct. 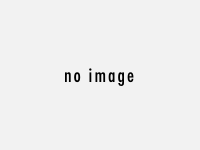 basedon the customer's requirements and test report. 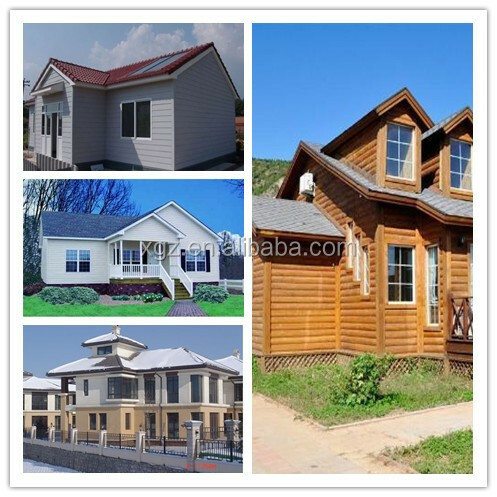 Assembly houses, villas, public buildings, commercial buildings, residential houses, firewall, fire-rated warehouse, cold storage, etc. 2. Local climate: Wind speed, snow load, earthquake etc. 3. Your production process : According to your production process to design . 4. 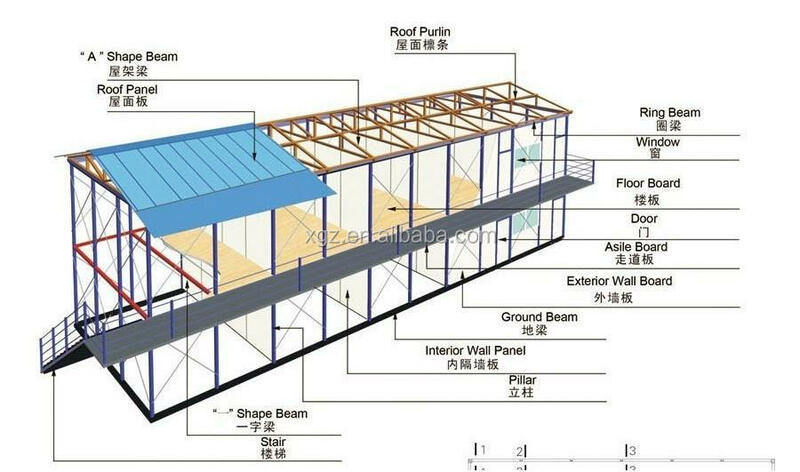 Roof and wall : PU/EPS/PVC Sandwich panel or color steel sheet . 5. Collecting light and ventilation : FRP-Lighting board and ventilation clerestory . 6. Doors and windows: Dimension, quantity, position to put them, Plastic steel or aluminum alloy . 7. Roof gutter : Stainless steel, galvanized steel, color steel plate . 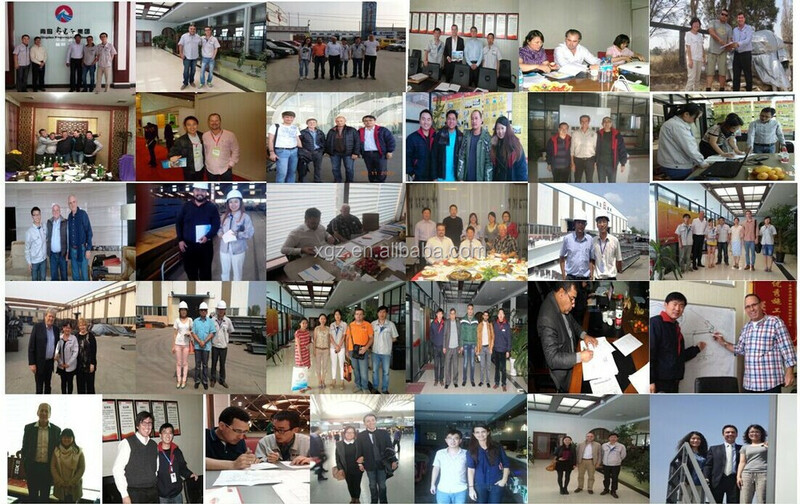 WELCOME TO VISIT XGZ GROUP!